You can make anything fascinating. You can make any brand impossible to resist. I’ll give you the secret, in my New York Times bestselling book, Fascinate. WHICH 5 WORDS WILL MAKE YOUR BRAND FASCINATING? Find out now. Sally Hogshead gives you the 5 words you need to increase prices, attract raving fans, and earn attention in a distracted world. Yes, branding is a form of witchcraft. I’ll do the black magic. Then, I’ll hand you the wand. 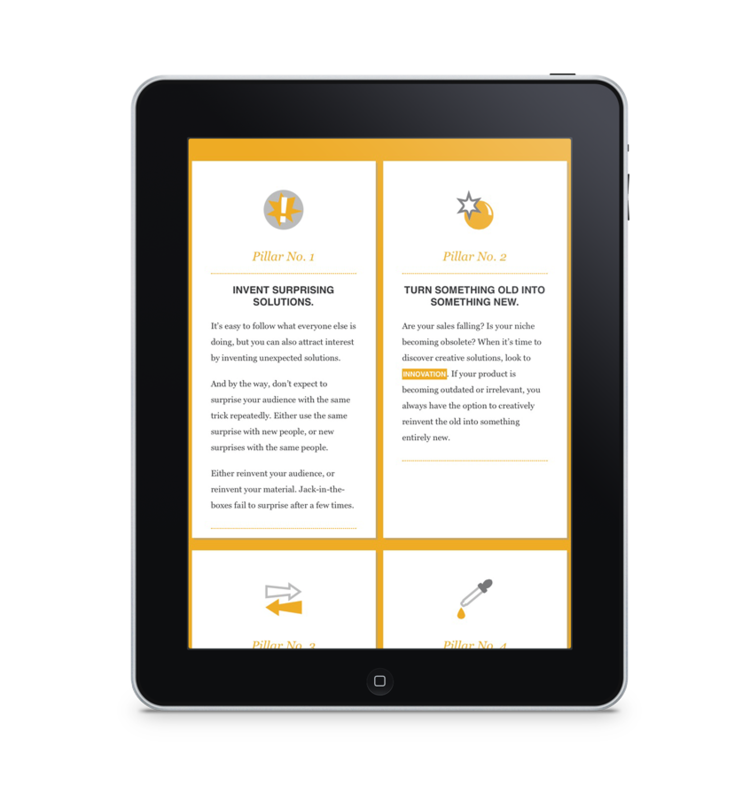 You might be asking yourself… “How can we assess your brand with just 28 questions?” We get it. This is a new approach to marketing. Sally Hogshead combined her decade of award-winning advertising leadership with her newest research on 700,000 people, The result? In 5 minutes, you’ll have the 5 words you need to captivate. WHAT IS A “BRAND FASCINATION PROFILE,” ANYWAY? Anyone can make anything fascinating. All it takes is a template and a system. Even if you can’t afford a marketing department or agency, you can create captivating communication. You can do this. And you can start right now. IT’S TIME TO TAKE BACK YOUR BRAND. 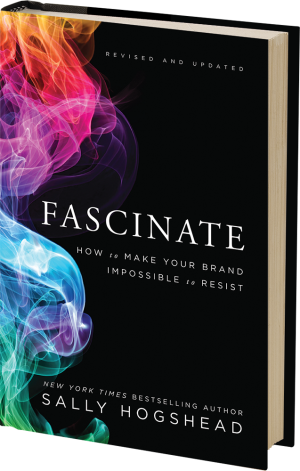 Make your brand impossible to resist by combining your profile with Sally Hogshead’s new book, Fascinate. 28 questions. 5 minutes. 1 top brand advantage. The Brand Profile is one step to make your brand impossible to resist. Get your results right here, then apply your results with the system inside of Fascinate. Take this quick assessment. Read your free Brand Profile. Then, get the step-by-step system to apply results inside Sally’s new book, Fascinate. Q: What is the Fascination Brand Profile? 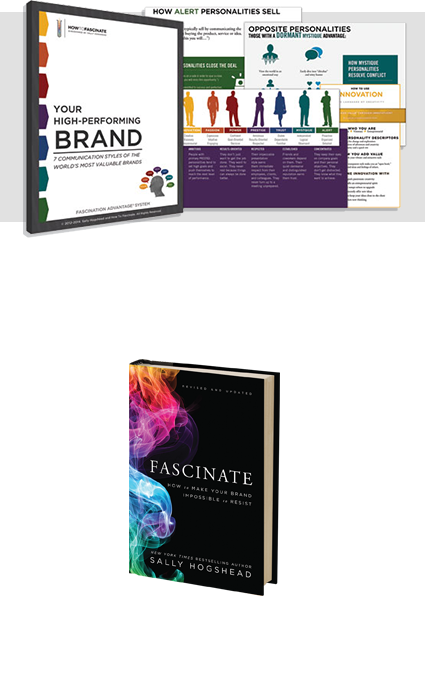 A: The Fascination Brand Profile gives you a shortcut to quickly learn more about what makes your brand fascinating. Think of it like a rapid-fire focus group, measuring how the world sees your brand. Your result will outline the direction that is most likely to captivate your clients and customers. Once you have your result, get in-depth action steps in Part II of Fascinate. The step-by-step system will show you how to make any product or service impossible to resist. Q: How can this help my marketing efforts? A: Fascination is a state of intense focus. Yet in order to fascinate customers and clients, your team needs to be focused as well. It’s tough to gain momentum when you’re running in a million directions and losing focus. That’s especially true with small businesses or brands without a huge budget. Yet a small marketing budget doesn’t have to mean small results. In Fascinate, Sally Hogshead turned her world-class branding experience into a marketing system for underdogs. Q: How should I apply my results? A: Once you have your result, read that section of the book in Fascinate to get more in-depth action steps. For instance, if your result is “Innovation,” read the chapter on Innovation (page 71) to find specific ways to create messages that captivate with creativity. Q: How is this different than The Fascination Advantage? A: Our first assessment, the Fascination Advantage, measures personal brands, and how the world sees you. This one is just for brands. It measures businesses and products. Q: I’m an entrepreneur. Is my personal brand the same as my business brand? A: If you’re the face of your company, then you’ll probably have a similar result. Yet this assessment isn’t measuring your personality or personal communication style, but rather, how customers and clients perceive your business brand. Q: What does it mean when two people from the same brand take the Brand Fascination assessment and get different results? A: The Brand Profile is a shortcut to a focus group. Different results give you a strong, focused starting point for discussion. When people get different results from the assessment, compare your findings and identify which direction is the future of the brand. To learn more, see Part III of Fascinate. Sally describes how brands use tactics to customize the message. Q: As a new business, I found the questions in this assessment to be geared for a major established business. How can this apply to a startup business? A: Most companies began as a startup at some point. : ) Yet even the smallest and newest companies still need a marketing strategy to hone communication. Use the questions (and results) to look ahead to your key areas of growth. Q: Is this the same as hiring an ad agency or marketing department? A: Your profile won’t replace a marketing team or extensive focus group, but will give you a fast shortcut to captivating clients and customers.